"Facebook is a rolodex of more than 750 million potential sources," journalist programme manager at Facebook Vadim Lavrusik told Journalism.co.uk. This guide explains why journalists should consider having a professional presence on Facebook by creating a fan page to connect with sources and readers, make contacts, build a brand as a journalist and promote articles. There are also examples of successful journalist fan pages and tips on using your page. According to Lavrusik, a professor teaching social media at the Columbia University Graduate School of Journalism and a journalist who has worked for Mashable and the New York Times, Facebook pages are used by journalists for "reporting, storytelling and engagement". Creating a professional fan page allows journalists to keep a personal profile for friends and family. "There can be an ethical challenge where a source wants to be friends with a journalist", Lavrusik pointed out, and having a page that people can simply 'like' can avoid journalists feeling either they must make friends with a source or to reject a friend request and therefore lose an opportunity to cement a relationship with a contact. "One of the things that Facebook has done is it's given a face to journalists," Lavrusik said, explaining that as a former newspaper reporter he was "used to hiding behind a byline". By creating a Facebook page a journalist pops up in a reader's news feed and they become more than a black and white name on the top of a story. "A lot of journalists have started to adapt a personalised form of writing so when they are posting or sharing one of their articles on Facebook, they are giving a more personalised take, they are giving a more behind the scenes look into their reporting," Lavrusik explained. "For some journalists this might feel unfamiliar as they're used to writing in a very objective voice, but many understand that this is actually enhancing transparency, which is something that journalists have always strived for." News finds the reader on Facebook rather than the reader searching for news. A face and a name of a journalist becomes a credible, trusted brand and helps the Facebook user to filter the noise of news. The average media organisation has seen a greater than 300 per cent increase in referral traffic from Facebook since the beginning of 2010, Lavrusik explained, and Facebook is now a crucial traffic driver for news sites. The Independent has seen a boost in its referrals by 680 per cent and the Mirror's web traffic rose 24 per cent following implementation of plugins. A Facebook page can help a journalist hunt for sources and information. News organisation NPR uses its Facebook page to find potential interviewees on a topic. The news team frequently finds a source in a matter of minutes. There is no limit on the number of connections a Facebook page can have. Profiles have a limit of 5,000 friends. 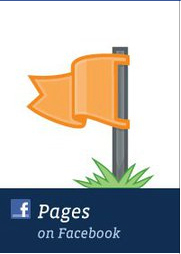 Facebook pages allow readers to subscribe to the page via RSS. There are additional reasons why journalists should be using Facebook more at this link. Although you are able to include an email address and other contact details in the info section of a fan page, one problem with Facebook pages is that readers cannot contact a journalist by his or her fan page and in turn journalists cannot directly contact readers or sources. It is a problem that head of the online journalism course at Birmingham City University professor Paul Bradshaw noted when he carried out a month-long experiment of using a Facebook page as a blog. "That's something that we are trying to figure out how to resolve," Lavrusik told Journalism.co.uk when asked about the problem of not being able to contact a journalist through a Facebook page. Another limitation highlighted by Bradshaw is that Facebook pages only allow status updates or posts of up to 420 characters. The Facebook page of New York Times journalist Nicholas D Kristof is one of the best examples. Lavrusik has spoken to him about its success. "He put it really simply and said a good story is a good story on Facebook." Kristof has notched up over 220,000 likes. "What he does great is he really leverages the different things you can do with a page. He links to articles and teases them in a very personal voice and gets hundreds of comments, but he'll also post photo albums of his reporting abroad, giving people an insight and visual view. And photos are very popular on Facebook, people really like to interact with photos." "What's also interesting, aside from just pointing people to articles, is the amount of times he'll report a status update while he is reporting from abroad. This might be real time updates on his reporting: people that he has interviewed, first hand accounts or what he has seen, and essentially they are these micro stories he posts in 420 characters and they add this view and idea of doing great storytelling." And if you follow a journalist's fan page and later see a link to a story in a news feed you a more likely to click on it, research by Facebook has proved. "The thing [Kristof] does really well is conversation. He really listens to his audience and if he is going abroad he will enlist his readers by asking them what he should cover. "He was telling me that when he was going to Haiti after the earthquake, he posted a status update and actually one of the responses he got ended up being his column just because it was such a great news tip." "He has nailed down that this is a conversation and that conversation is a big part of news itself." Neal Mann, who is better known as Fieldproducer, has not only built up a large Twitter following by being a great communicator but also uses a Facebook page. Consider the personal touch added by this link he posted recently: "My latest Spotify playlist, some of the tracks that kept me company in Libya"
He has posted behind the scenes pictures from his recent time in Libya. And when it comes to a voice and willingness to be part of the conversation, consider the following post: "Thanks for all the comments during my time in Libya, if you have any questions on how how we covered the story just ask." Middle East correspondent for the Independent Robert Fisk has a page but it differs in the way it works from the above examples. It takes feeds from stories posted on the Independent's website and posts them in the news feeds of Fisk's more than 10,000 fans. What the Independent has done is it "has turned his index page on the website into an open graph object, which is set up so it can publish updates via RSS into people's news feeds if they have 'liked' and essentially committed themselves to a social subscription to that section", Jack Riley, head of digital audience and content development at the Independent told Journalism.co.uk. There are more details on how the Independent uses Facebook to push specialised content to readers on Poynter. Technology correspondent for Channel 4 News Benjamin Cohen is another journalist who uses Facebook, Twitter and Google+ effectively. His posts of links to Channel 4 News content and his blog posts are teased in a personal voice . Here is just one example: "Catch me explain the iCloud buy heaving a wheelbarrow full of my stuff including a photo of my mum to the top of Primrose Hill!" Media editor at the Independent Ian Burrell teases and posts links on his page. Burrell has added a few photos to show fans, including one of him interviewing media mogul Richard Desmond. 10. Monitor success. You can check on click-throughs to a news site using the site's analytics and as a journalist with a page you will have access to Facebook Insights.